Gamer is a 2009 American science fiction action film written and directed by Mark Neveldine and Brian Taylor. The film stars Gerard Butler as a participant in an online game in which participants can control human beings as players, and Logan Lerman as the player who controls him. Alongside Butler and Lerman, it also stars Michael C. Hall, Ludacris, Amber Valletta, Terry Crews, Alison Lohman, John Leguizamo, and Zoë Bell. 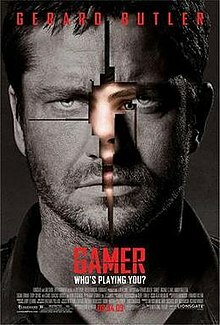 Gamer was released in North America on September 4, 2009, receiving generally negative reviews from critics, who found the plot, direction, and script disappointing, though its performances, effects, and action sequences were praised. It received a mixed reception from audiences, and was a box office bomb, grossing $43 million worldwide against a production budget of $50 million. In 2034, computer programmer Ken Castle (Michael C. Hall) invents self-replicating nanites that replace brain tissue and allow humans to control other humans' actions and see through their eyes. The first application of Castle's "Nanex" technology is a virtual community life simulation game, Society, which allows gamers to manipulate live actors as their avatars. Society becomes a worldwide sensation, making Castle the richest man in the world. He then creates Slayers, a first-person shooter where the "characters" are death-row prisoners using real weapons in specially created arenas. Unlike Society actors, Slayers participants are not paid; instead, they volunteer in exchange for the promise that any Slayer who survives 30 matches will earn his freedom (though no one ever has). John "Kable" Tillman (Butler) is the crowd's favorite, having survived a record 27 matches. He is exclusively controlled by Simon (Lerman), a seventeen-year-old superstar gamer from a wealthy family. An activist organization called the "Humanz" hacks a talk-show interview with Castle and claims that his technology will one day be used to control people against their will. The Humanz also disrupt Society play, but Castle sees both these actions as trivial. However, Castle feels threatened by Kable's winning streak, and introduces a new inmate into Slayers, Hackman (Crews), specifically to kill Kable. Unknown to anyone else, Hackman will not be controlled by a player, and thus not be handicapped by the "ping" that causes a small but dangerous delay between the player's command and the Slayer's action. Kable/Tillman's wife, Angie (Valletta), works as a Society character, but in spite of her earnings, she is refused custody of their daughter Delia, who has been placed with a wealthy family. The Humanz contact Kable and Simon separately, warning them that Castle has no intention of letting Kable survive, and offer to create a mod that will let him escape, but only if Simon relinquishes control during the game. The escape is successful, and news outlets report that Kable has been fragged, which puts Simon in a difficult position: he is labelled a "cheater", locked out of his bank account, and investigated by the FBI for helping Kable escape. Tillman is brought to the Humanz' hideout; he refuses to help their fight against Castle, but learns of Angie's current location in Society. He rescues her, escaping from both Hackman and Castle's security forces. They are met by Gina (Sedgwick), the talk show host, secretly assisting the Humanz. The Humanz deactivate the nanites in Angie and Tillman's brains, and Tillman remembers that the original nanites were tested on him while he was still in the military. Under Castle's control, Tillman shot and killed his best friend, and was imprisoned. Upon learning that Castle is the wealthy father who adopted Delia, Tillman infiltrates his mansion to get her back. He locates Castle, who reveals that his henchmen have already tracked down the Humanz' lair and killed all of them. He also reveals that 98% of his own brain has been replaced with nanites, but this allows him to control others, rather than be controlled. He plans to release air-borne nanites which will infect the entire United States within six months, giving him ultimate control. Hackman attacks Tillman, who easily kills him. Tillman then attacks Castle, but is frozen in place, as Castle explains that his men have reactivated his and Angie's nanites. Unknown to Castle, Gina and Trace (Lohman) escaped the murder of the Humanz, and patch into the Nanex, revealing the confrontation to the world and exposing Castle's plans. It also unblocks Simon's account and restores his control of Tillman. Castle tries to manipulate Tillman into killing his own daughter, but he resists, and then Simon's control allows him to attack Castle. He and Simon wrestle for control over Tillman, but Tillman tells Castle to imagine Tillman's knife stabbing him. Castle unconsciously does so, allowing Tillman to kill him and removing his control over everyone. With Castle dead, Tillman convinces his technicians to deactivate the Nanex, freeing all the "characters" in Society and Slayers. The film closes with the Tillman family taking a trip down a country road, ending with the words "Game Over". Gerard Butler as John "Kable" Tillman, the highest-ranked warrior in the game Slayers. Amber Valletta as Angie "Nika" Roth Tillman, Kable's wife, an avatar in Society. Michael C. Hall as Ken Castle, the wealthy manipulative, ruthless and famous creator of Society and Slayers, and a top genius professional computer programmer. Kyra Sedgwick as Gina Parker Smith, a famous talk show host who meets the Humanz and investigates them. Logan Lerman as Simon Silverton, the 17-year-old gamer "playing" Kable. Terry Crews as Hackman, a psychopathic inmate sent to murder Kable. Alison Lohman as Trace, a member of the Humanz. Ludacris as Brother, the spokesperson and leader of the Humanz. Aaron Yoo as Dude, a member of the Humanz and a hacker. John Leguizamo as Freek, an inmate who befriends Kable. Zoë Bell as Sandra, an inmate. Mimi Michaels as Stikkimuffin, another teenage gamer. A fan of Simon. Jonathan Chase as Geek Leader, the head of Castle's technical team. Keith David as Agent Keith, a CIA agent. In May 2007, Lakeshore Entertainment re-teamed with Mark Neveldine and Brian Taylor, the creators of Crank (2006), to produce a "high-concept futuristic thriller" called Game. Neveldine and Taylor wrote the script for Game and were slated to direct the film, while actor Gerard Butler was cast into the lead role. Principal photography took place in Albuquerque, New Mexico for a 53-day shoot. Filming was at the Albuquerque Studios and on location around Albuquerque. Multistory sets were built on parking lots in downtown Albuquerque to depict buildings that were blown up in the film, and other sets were built on the back lots near the studios. The crew used special hand-held Red One digital cameras, which allowed the special effects team to begin work normally done in post-production after each day's shooting. In March 2009, the film's working title was changed from Game to Citizen Game. In May 2009, another name change was announced, the new name being Gamer. Gamer had an opening day gross of $3.3 million and ranked fourth at the box office. In total, the film earned $9.2 million in its opening weekend. Overall, the film grossed $21.5 in the United States and Canadian and $20.7 million in other territories for worldwide cumulative of $42 million, against its $50 million budget. The film received negative reviews from critics. The film holds a 28% "Rotten" rating from 75 reviews on Rotten Tomatoes; the site's consensus being "with all of the hyperkinetic action and none of the flair of Mark Neveldine and Brian Taylor's earlier work, Gamer has little replay value." Critic Joe Neumaier of The New York Daily News, agreed, calling it a "Xerox of a Xerox" and citing a number of films it supposedly takes elements from, including The Matrix and Rollerball. RVA Magazine noted that Gamer's plot was overly similar to The Condemned and commented that Gamer "hates its primary audience" and "tries to criticize the commercialization of violence, even though it itself is commercialized violence". Cultural critic Steven Shaviro authored a 10,000 word defense and analysis of the film that he posted online, and eventually re-worked into the penultimate chapter of his book, Post-Cinematic Affect (Zer0 Books, 2010). ^ "GAMER (18)". British Board of Film Classification. August 14, 2009. Retrieved February 6, 2016. ^ a b c "Gamer (2009)". The Numbers. Retrieved January 8, 2011. ^ "Exclusive Behind-the-Scenes Clip - Gamer". DreadCentral. January 20, 2010. Retrieved January 8, 2011. ^ Guider, Elizabeth (May 16, 2007). "Lakeshore, Butler to play Game". Variety. Retrieved December 9, 2007. ^ Kamerick, Megan (August 31, 2007). "New film production fills Albuquerque Studios". New Mexico Business Weekly. Retrieved December 9, 2007. ^ Douglas, Edward (November 19, 2007). "On the Set of Gerard Butler's New Sci-Fi Action Flick!". ComingSoon. Retrieved December 9, 2007. ^ "IGN: Citizen Game Trailer, Wallpaper, Pictures, Soundtrack and More". IGN. Archived from the original on April 22, 2009. Retrieved April 5, 2009. ^ "Lionsgate Publicity". Lionsgate Publicity. Archived from the original on July 21, 2011. Retrieved April 5, 2009. ^ "Gamer – In Theaters September 4". Gamerthemovie.com. Archived from the original on March 13, 2010. Retrieved May 9, 2009. ^ "Exclusive Poster Premiere: Gamer - UGO.com". Movieblog.ugo.com. Archived from the original on May 11, 2009. Retrieved May 9, 2009. ^ "Updated: Another name change for Game + new motion poster + Trailer on Xbox live". Quietearth.us. Archived from the original on March 28, 2012. Retrieved May 9, 2009. ^ "Gamer". Rotten Tomatoes. Retrieved January 8, 2011. ^ Neumaier, Joe (September 4, 2009). "New York Daily News reviewed negatively of Gamer". Daily News. Retrieved January 8, 2011. ^ "RVA's review of Gamer". RVA Magazine. September 4, 2009. Retrieved January 8, 2011. ^ "Gamer". Steven Shaviro. Retrieved January 2, 2010.